We’re Open Table Diners’ Choice winners, thanks to you! Thank you for your positive comments! The Three Crowns, Chagford has been named an Open Table Diners’ Choice winner as a result of feedback from diners who booked through Open Table. We really value our customers’ comments, so thank you for taking the time to tell us your views. Let’s celebrate, Skinny Prosecco is here! Come along to our fun quiz night – £1 to enter, 8pm start. Always the last Thursday of the month – see you there! A super Soup & Sandwich deal! Welcome to the Three Crowns, a beautiful, part-thatched 5-star inn set in the heart of the pretty Dartmoor town of Chagford. Behind its imposing granite facade, the Three Crowns is a magical mix of 13th-century features and contemporary comfort and style. From beamed ceiling and huge inglenook fireplaces to a glass atrium and stunning courtyard garden, the Three Crowns is a delightful place to enjoy great food and a comfortable stay. We offer a delicious menu featuring fresh, local seasonal produce, cooked to order by our talented team. We also offer an extensive wine list and a great selection of soft drinks. We have a policy of ‘keeping it local’ and use local ingredients in our dishes and stock local wines and juices. Whether you choose to eat in the cosy, traditional front bar with its log fire and mullioned windows or the stunning light and open glass atrium we are sure you will enjoy your meal. 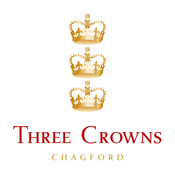 The Three Crowns has 21 en-suite boutique bedrooms refurbished to a high standard and successfully blending character with modern design and convenience. In each room, you will find a contemporary en-suite, a divinely comfortable Vi-Spring bed, flat-screen TV, internet connectivity, bottled water, bathrobes and i-pod docking stations. FREE wireless internet access is available throughout the Three Crowns. With the weather forecast looking good for Easter, why not come and explore the moor more?! And what could be better after a bracing walk than lunch, or a cream tea, or dinner at the Three Crowns in Chagford? If map reading fills you with dread, we have our own walks leaflet (free at the bar) with easy to follow directions. © Three Crowns, Chagford. Website: Skim.